LOVE NEVER FAILS. Taken from 1 Corinthians 13:8. This beautiful sentiment is set against a lovely design of butterflies and scrolled detail. Makes a perfect wedding or anniversary gift. Designed by Diana Thomas. Design size: 6 x 8". 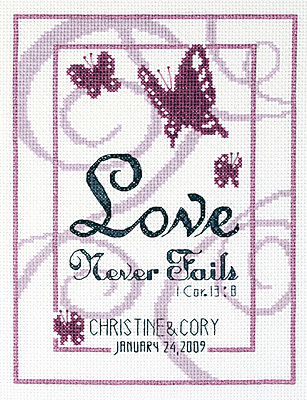 Kit contains: 14ct cotton Aida, 6-strand cotton floss, needle, graph, and instructions.